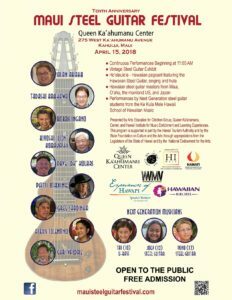 The 10th anniversary of the Maui Hawaiian Steel Guitar Festival will be commemorated on Friday and Saturday, April 13-14, 2018 at Kāʻanapali Beach Hotel and expanded to Sunday, April 15, at the Queen Ka‘ahumanu Center. The Hawaiian steel guitar is considered to be the only modern instrument indigenous to Hawai‘i. Joseph Kekuku, a young Hawaiian from Lā‘ie, O‘ahu is recognized as the inventor of Kika Kila, the Hawaiian steel guitar. 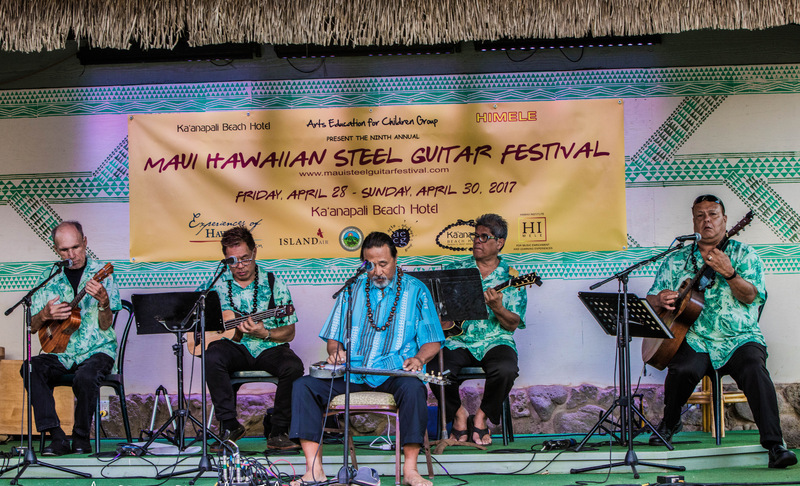 Since the festival’s inception, steel guitar master, Alan Akaka and his team have established steel guitar festivals on Kaua‘i, O‘ahu and Hawai‘i Island. 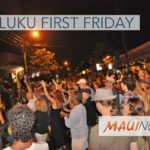 Festivities at the Kāʻanapali Beach Hotel festival will include open stage performance sessions on Friday from 11 a.m. to 4 p.m., with two days of ho‘olaule‘a pageants with six presentations each night from 5:30 to 8:30 p.m. Master steel guitar players will host kanikapila jam sessions for the public each night at 9:30 p.m., with steel guitar workshops on Saturday, including cultural activities and a vintage steel guitar exhibit courtesy of Geri Valdriz. The lineup at KBH will feature Alan Akaka, Tadashi Arakawa, Bobby Ingano, Joel Katz, Kiyoshi “Lion” Kobayashi, Dave “DK” Kolars, Patti Maxine, Greg Sardinha, Alexis Tolentino and Geri Valdriz. Ke Kula Mele Hawai‘i Next Generation student musicians include Tai, Joey and Pono. Special guest performers from Japan include a student quartet, Anegogumi, featuring Yoshiko Seo on steel guitar, and the 17-member Yokohama Hawaiian Music Academy Band with steel guitar, guitar, bass and ‘ukulele players. 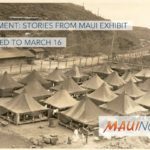 The April 15 festival at Queen Ka‘ahumanu Center will showcase Valdriz’ vintage steel guitar exhibit installed at the Story of Hawai‘i Museum and a ho‘olaule‘a pageant, featuring 10 steel guitar presentations beginning at 11 a.m. and ending at 4 p.m. The lineup at QKC includes Alan Akaka, Tadashi Arakawa, Bobby Ingano, Kiyoshi “Lion” Kobayashi, Dave “DK” Kolars, Patti Maxine, Greg Sardinha, Alexis Tolentino and Geri Valdriz. Ke Kula Mele Hawai‘i Next Generation student musicians Tai, Joey and Pono will open the pageant. Admission to both events is free and all are welcome. 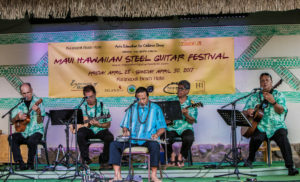 The Maui Steel Guitar Camp precedes the festival on Wednesday, April 11 and Thursday, April 12 at Kāʻanapali Beach Hotel. The goal of the camp is for attendees to play class-assigned Hawaiian songs on the lap steel guitar. 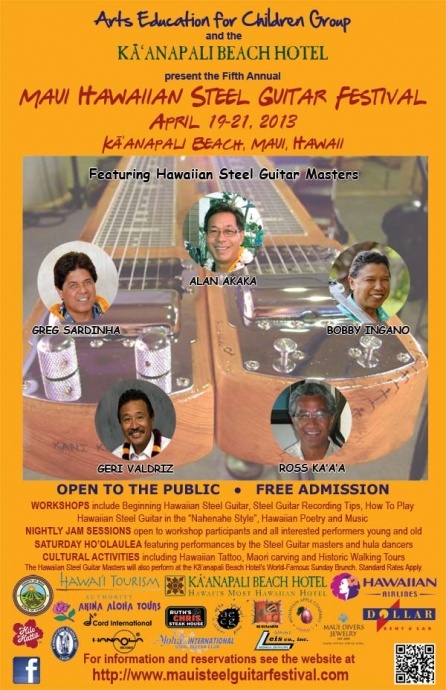 Three intensive sessions (two in the morning and one in the afternoon) will be conducted each day by Alan Akaka and Greg Sardinha, two of Hawai‘i’s steel guitar masters. The cost is $225 per person and no prior experience is necessary. A silent auction will be held on April 13 and 14 to help underwrite festival production costs and perpetuate music education in Hawai‘i. Those who wish to donate certificates and items for the auction can contact Arts Education for Children Group resident Bryant Neal at 808-283-3576. Donations are tax-deductible.